Caribbean ocean views! There are marble floors throughout the condo. the 'Jewel of the Caribbean'. waves! Take a refreshing dip in one of two lovely oceanside pools. chairs and small table. You can sit out and savor the ocean scenery! Or, kick back, and enjoy a scenic meal outdoors. Bathroom with large shower, large closet, and shelves. 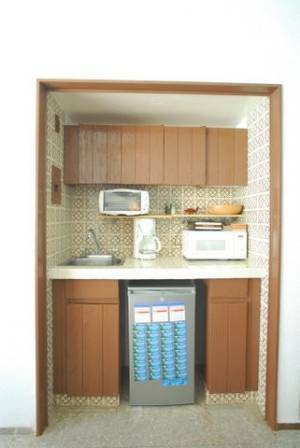 arranged by calling Alex (our Mexican partner) at 185-7210.
small refrigerator, coffee maker, broiler, burner. Pay phone in lobby. Condo has boogie boards, water toys, iron, hair dryer, books, cards, games. 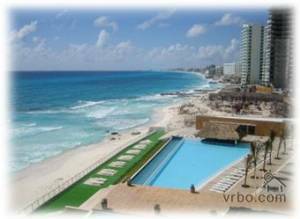 tours, room service, car rentals, and water sports. There is also a bank nearby and they offer currency exchange. Starbucks is near and has free wifi, if you have a laptop. Refresh yourself in one of the two beautiful oceanfront pools, or take part in on of the wide variety of activities we have to offer. 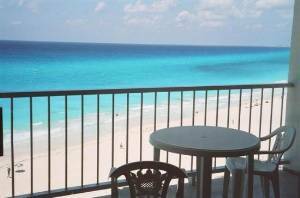 Lovely, larger oceanview balcony, and patio furniture. Kitchenette. 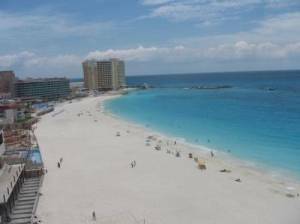 Close to the trendy nightclubs- "hot spots"- Sr. Frogs, Cocobongos, etc. We offer last minute discounts of 5-20% depending on how close the booking is to the rental date- see website. 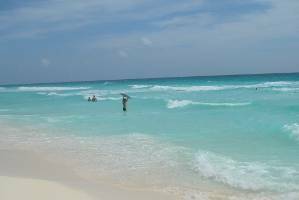 Mayan ruins of Chitzen Itza and Tulum, the islands of Isla Mujeres, XCaret, scuba, snorkeling, boogie boarding, and much more! 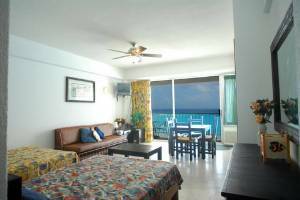 Larger balcony, with patio furniture, to watch the gorgeous ocean view. 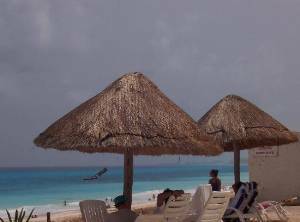 Lovely white sand beach, with crystal, turquoise, warm water! It has 2 full beds, kitchenette, 1 futon couch, table and chairs, kitchenette. It has microwave, burner, frig, coffee maker, broiler, and utensils. Nice ocean view pool, one of 2. Relax under the palapas, and watch the beach scenery. View from balcony of the lovely beach next door. Deposit: 25% due to hold reservation, balance due 30 days prior to rental date. Other Fees: $40 cleaning fee if less than 4 days. Min. days for holiday- see website.